How Hormonal Imbalance affects…well, everything! The list goes on. The causes can also be quite manifold, and they often stem from poor eating habits, irregular sleep patterns, over-(or under-)supplementation of essential minerals, psychosomatic issues like stress, and other emotional/mental/physical/environmental factors. The trouble is, getting your body back on track usually takes time – as much time as it took to fall off -track, at least! So what does my endocrine system actually do? It just takes a little TLC! Now that we know just how necessary it is to keep our endocrine system in good health - the question is, how? Sometimes, all it takes is a few simple and consistent adjustments to see a positive, long-lasting affect. Here at MMG, we like to think that it just takes a little TLC ! Touch itself appears to stimulate our bodies to react in very specific ways. The right kind can lower blood pressure, heart rate, and cortisol levels, stimulate the hippocampus (an area of the brain that is central to memory), and drive the release of a host of hormones and neuropeptides that have been linked to positive and uplifting emotions. The physical effects of touch are far-reaching. As an added bonus, by working closely with your meridian, lymphatic and endocrine systems, your massage therapist is able to directly improve the quality of your glands and organs, and will often offer expert advise on how to further support or detoxify your body as needed. Massage is an essential form of physical support, and a wonderful way to help manage, or even heal, an incredible variety of bodily distresses. Now you know how it can help make adjustments to your subtler – but no less important - bodily functions as well! TCM is an ancient, holistic tradition encompassing both diagnostic assessment and natural medicine. It is believed that no physical ailment exists in a solitary plane – but reverberates throughout all planes of existence, and manifests in various ways. Because the tradition is so old, it includes practiced observations for almost every bodily function and state of “dis-ease” you might think of. Take a look at this Meridian-based clock, for example. It maps out the internal flow of energy from one organ to another, noting the most common emotional reactions during those times, as well as a few of the harmonious activities they are associated with. I like to consult this clock if I find myself feeling a little off-kilter throughout the day, or if I wake up in the middle of the night at the same time for days on end! It helps to readjust my approach to any physical malcontent by forcing me to think about my body in a “holistic” way, taking into account emotional issues, mental stressors, and other less tangible needs as forms of “medicine” to help heal (or at least support) those crucial organs or systems. 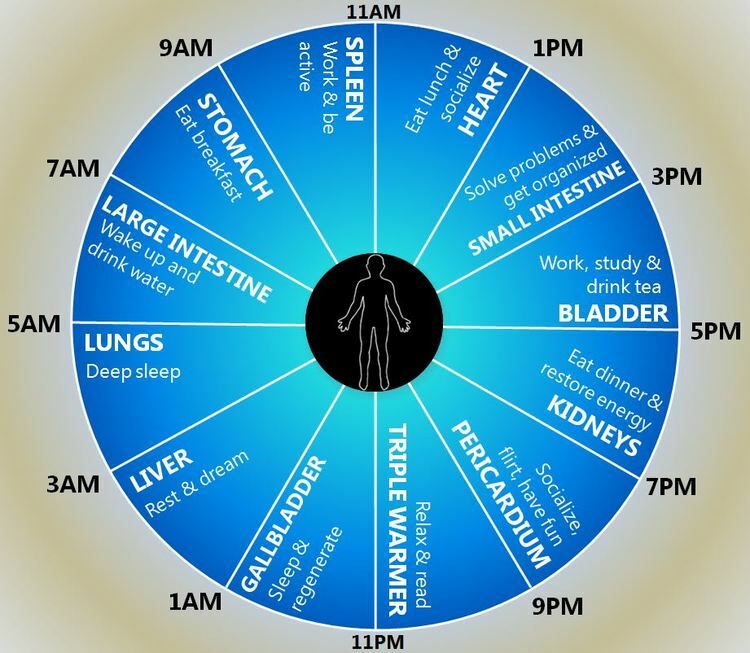 Try mapping your day around the meridian clock, and see how making a few simple adjustments to your routine can help re-balance your body and lighten your state of mind overall!